West of Girne Caddesi, the Arabahmet district is the counterpart to south Nicosiaâs Khrysaliniotissa neighbourhood, with imposing Ottoman houses on Zahra, Tanzimat and Salahi Sevket streets. Since 1995, as part of the Master Plan, many fine buildings on the parallel, narrow lanes between Tanzimat and Salahi Sevket have been renovated and rented out to various cultural and commercial organisations, though as yet there are scarcely any restaurants or nightlife venues on a par with those around south Nicosiaâs Famagusta Gate. The Green Line is less obtrusive here, so many other houses are still inhabited despite their semi-dereliction. Also forlorn is the elaborate, octagonal Ottoman fountain at the Y-junction of Zahra and Tanzimat, which was allowed to run dry some years ago. 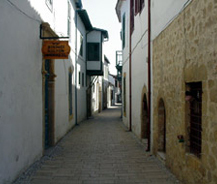 Arabahmet was, until the troubles, the Armenian quarter, and had been so since the tenth century (though most of Cyprusâ Armenians are much more recent arrivals from Anatolian Silicia). Salahi Sevket was, in British times and for a while after, Victoria Street, and you can still find plenty of ornate mansions with ironwork and Armenian (sometimes Greek) inscriptions over the door-ways. The spire of the Roman Catholic church, straddling the Green Line, punctuates the south end of Salahi Sevket Sokagi; east of it, and now visitable, stands for fourteenth-century Armenian church of the Virgin, originally a Benedictine monastery but handed over to the Armenians as a reward for siding with the Ottoman invaders. Ironically, the Armenian community was expelled from this area at the end of 1963 by the TMT, on the grounds that they had allied themselves with the Greek Cypriots. The church is now, unsurprisingly, fairly comprehensively trashed, with an unfinished cloister on the north side held up by scaffolding. Inside, you can still admire fine vaulting and a wooden altar canopy and a yinaikonitis which have miraculously survived. Immediately west of the church sprawls the Kazyatagi Burcu (Roccas Bastion), the point of closest contact to the South in all of North Cyprus â the buffer zone dwindles to nothing here. It was opened as the Yigitler Park in the late 1990s, to the profound consternation of the Greek Cypriots, who claimed it would make a perfect platform for spying. From the edge of the landscaped area, you can indeed take in the CYTA building, the municipal theatre and municipal gardens of South Nicosia, and (were you so inclined) easily converse with pedestrians on the sidewalk thirty feet below, at the base of the sloping fortification. With the unrestricted opening of the Ledra Palace crossing, the parkâs novelty value has waned, but the use of cameras here is still strictly banned.